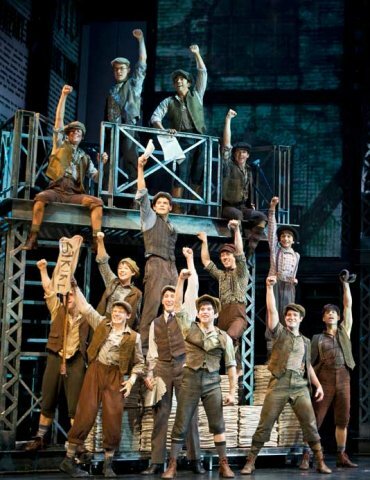 So … pretty much any of us hovering between 25 and 35 (or so) know and love Newsies. For some of us, it was our first introduction to live-action musicals. And for many-a theatre guy I’ve known, it was what sparked them to want to act in the first place. Well, kids … it’s now, officially*, a stage show. Backed by Disney Theatrical, book by Harvey Fierstein, and music by Alan Menken himself. And I got to see it on Sunday. If you are ANYWHERE within range of Newark, NJ, you MUST go see this show. Seriously. I bussed up (4.5 hours) and back (4.5 hours) in the same day for this one. And it was SO worth it. The story has been changed a bit (Brooklyn shows up later, David & Les’ family isn’t introduced, Jack is an artist), a few characters are missing (Denton and Sarah), a few are added (Katherine … a combination of Denton and Sarah) and there are a couple other tweaks (for example … Medda is totally different. Then again, who could even BEGIN to live up to Ann-Margaret?). But really … it’s all for the better. The original version will always be the “true” version for me … but I’m totally on board with this one. The cast is INSANELY talented. 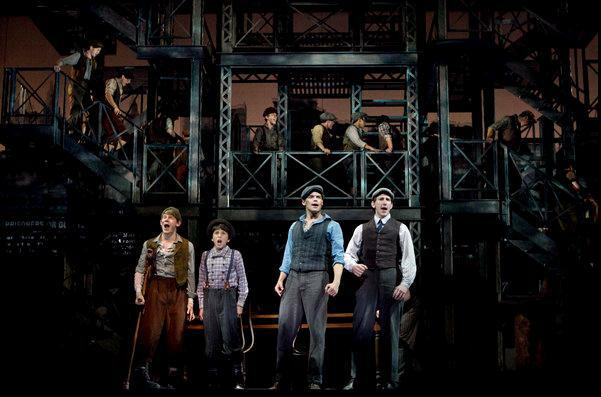 I cannot get over the stunning control Jeremy Jordan (Jack) has over his voice. He goes from SCREAMING to singing a ballad in (no kidding) 15 seconds. The notes he hits are insane. And the dancing … holy crap. At one point I turned to Paul (my date for the show) and said “this choreography is too hard, they’ll never be able to put it up with anyone else”. I sincerely hope I’m wrong. It was STUNNING. At any given moment there was so much going on that I’m going to have to see it again. And again. And I’d be remiss if I didn’t mention the incredible set design. Three 3 story fire-escapes, tracked to move back, forth, and all around. Smaller pieces that rolled in and out as necessary. 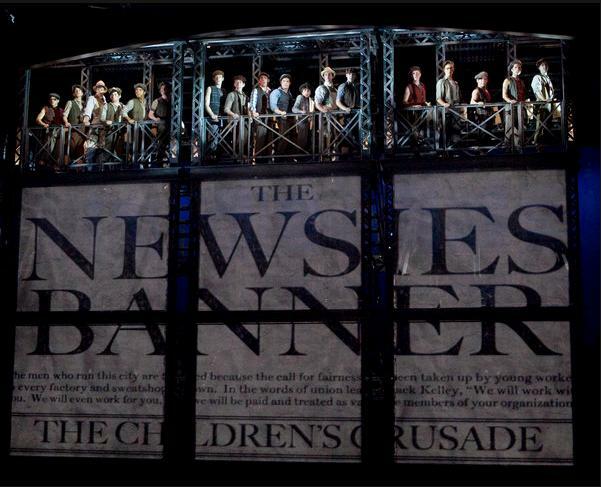 And some of the best projection work I’ve seen on stage. Seriously, seriously well done. It became anything they needed it to be … and made me catch my breath several times. To see those boys running around and jumping on/off them WHILE THEY WERE MOVING (not just moving … spinning) … good lord. Amazing. So really … go. See it. I promise it’s worth the money. 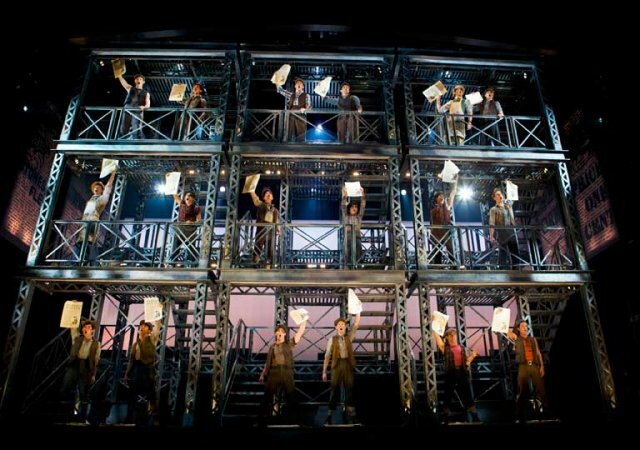 And when it makes the move to Broadway (because it will) … I’ll be there … in orchestra seats. Paper Mill Playhouse – Millburn, NJ. (NYC people … there’s a light rail train that goes from Penn Station and stops 2 blocks from the playhouse. Couldn’t be easier.) The show runs through October 15th. 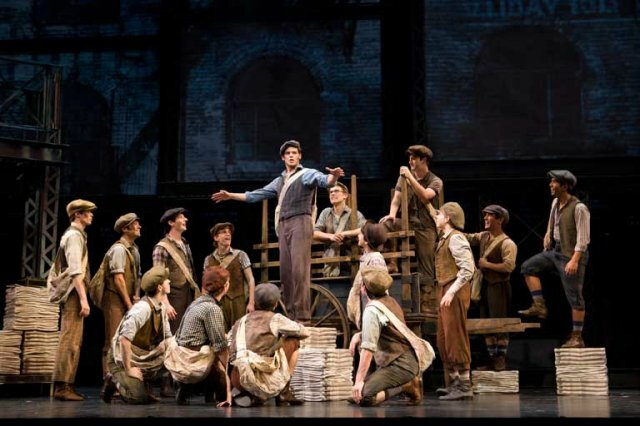 All photos and video courtesy of Paper Mill Playhouse. I so want to see this. New Jersey is just a little too far from Texas unfortunately. I read something a while ago about this, and Harvey Fierstein was talking about the changes he was making and I got all excited. I was really worried it was going to be bad, which would have just killed me a little because I so incredibly adore the movie. I am very very happy to hear it is actually good. There were definitely parts I wasn’t thrilled with, but all in all, I loved it. Jack’s character is different … but it has more depth, he’s not just mischevious. It was odd at first, because Christian Bale and David Moscow (and their adorable “singing”) was stuck in my head … but they definitely won me over. With Disney behind it, it’ll tour I bet. See it when it’s near you!